One of the days marked fervently by the Palestinian Authority is the anniversary in March of the most lethal terror attack against Israel - the Coastal Road massacre in which Palestinian terrorists murdered 37 civilians, among them 12 children. The attack was led by female terrorist Dalal Mughrabi who the PA since has turned into a role model and hero for Palestinian children and society in general. "The Dalal Mughrabi Sports Festival"
And in cooperation between the Beitunia Upper Elementary School for Girls and the Freedom Co-ed Elementary School"
Posted text: "During her participation in the Dalal Mughrabi Festival, held at the Beitunia Elementary School for Girls in the presence of the director of the district's Education Directorate (i.e., branch of the PA Ministry of Education) and the mayor of Beitunia, [District Governor of Ramallah and El-Bireh] Dr. Laila Ghannam emphasized that our children, who are suffering from the occupation's brutality, are determined to continue on the path with the same certain steps, towards the realization of the national rights. She explained that it is the right of these generations to live in freedom and dignity on their land, far from the occupation and its tyranny. On the occasion of [International] Women's Day, Ghannam blessed all the women of Palestine - who have brought children into the world, fought, and built glory that will not be erased." This is not the first sports event glorifying murderer Mughrabi at a PA school. Palestinian Media Watch documented that a basketball game for high school girls was named after Dalal Mughrabi in 2016. 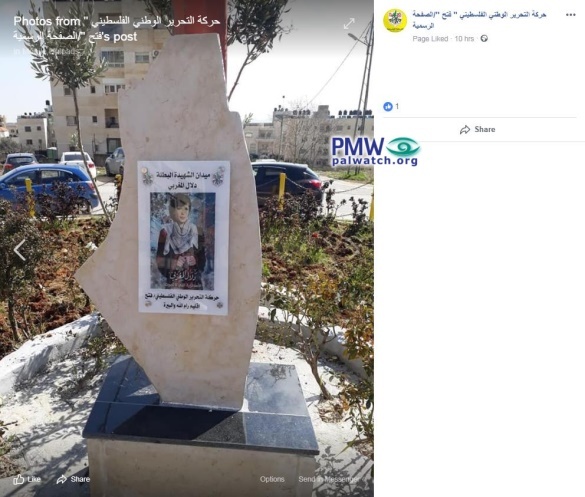 Another Palestinian activity to glorify terrorist Mughrabi is the preparation of a square named after her in the Ramallah district. 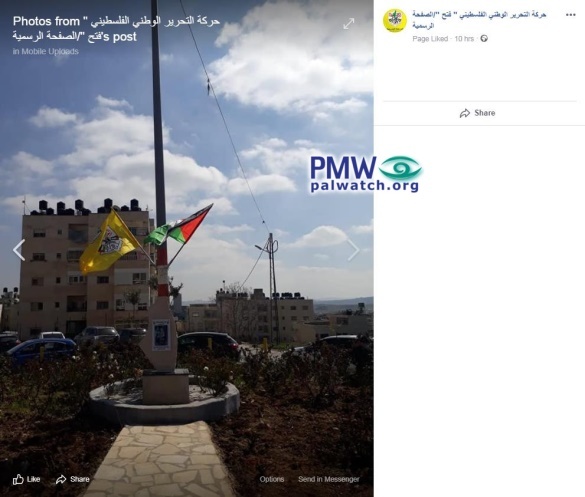 PMW reported that the PA intended to name a square after Mughrabi already in 2010. Following PMW's exposure, 20 members of US Congress sent a letter to PA Chairman Abbas condemning the PA's glorification of terrorist Mughrabi and the PA cancelled the inauguration of the square. However, Fatah did not give up the idea completely and arranged a popular inauguration instead of an "official inauguration" of the square instead. In 2015, PMW reported on a new attempt by the PA to inaugurate the square. "[Rashida] Mughrabi explained that [the monument at] Martyr Dalal Mughrabi Square has been shattered more than once, and that anonymous young people are the ones who did it. She added that the restoration has been undertaken in a personal-family effort." She noted that the monument and square were restored a few days ago, and that they have worked diligently on inaugurating the square at the time of the anniversary of Dalal's death as a Martyr. She also said that the effort was made through the Fatah Revolutionary Council and [Fatah's] Ramallah branch." "Fatah's Ramallah and El-Bireh District [Branch] Secretary Muwaffaq Sahwil explained that the postponement was done at the request of the leadership because it is busy, and that the inauguration will be held in the coming days. Sahwil explained to Al-Hadath that the postponement is connected to the presence of [public] figures [at the inauguration], and that because they are busy the inauguration has been postponed." Posted text: "On the anniversary of the coastal operation, which was led by heroine Dalal Mughrabi - the inauguration of Martyr Dalal Mughrabi Square"
Palestinian National Liberation Movement 'Fatah' - Ramallah and El-Bireh branch"
Coastal Road Massacre - In March 1978, a group of Fatah terrorists from Lebanon led by female terrorist Dalal Mughrabi hijacked a bus on Israel's Coastal Highway. Confronted by the Israeli army, the terrorists murdered many of the passengers on the bus, in total 37 civilians, 12 of them children, and wounded more than 70. The attack, orchestrated by arch-terrorist Abu Jihad (Khalil Al-Wazir), is known in Israel as the Coastal Road Massacre, and is the most lethal attack in Israel's history. Headline: "Who is fighting Martyr Dalal Mughrabi in Ramallah?" Mughrabi explained to [independent Palestinian weekly paper] Al-Hadath that at the end of 2009 and beginning of 2010, they began to work on establishing Martyr Dalal Mughrabi Square following an agreement with the El-Bireh Municipality and with the [Ramallah and El-Bireh] district. The preparations for the square ended at the time of the anniversary of Dalal's death as a Martyr, and it was proposed that the inauguration take place on that anniversary, but then she [Rashida Mughrabi] received a call in which it was demanded to postpone the inauguration due to the Israelis' threat to invade the city and destroy the square. However, she insisted and inaugurated [the square] in the presence of a small number of activists in Ramallah. Mughrabi explained that [the monument at] Martyr Dalal Mughrabi Square has been shattered more than once, and that anonymous young people are the ones who did it. She added that the restoration has been undertaken in a personal-family effort. She noted that the monument and square were restored a few days ago, and that they have worked diligently on inaugurating the square at the time of the anniversary of Dalal's death as a Martyr. She also said that the effort was made through the Fatah Revolutionary Council and [Fatah's] Ramallah branch. Mughrabi explained: 'Yesterday, Sunday [March 10, 2019], I called the Revolutionary Council secretary in order to clarify about the distribution of the invitations, and I was surprised to discover that the invitations had not been distributed.' 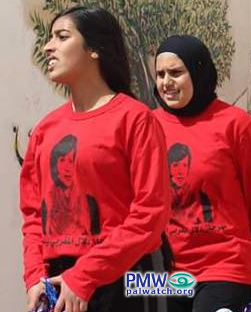 She added that she contacted the organization, which informed her that the inauguration had been postponed because [Fatah's Ramallah and El-Bireh District Branch Secretary] Muwaffaq Sahwil had received an order according to which the inauguration would not be taking place. Mughrabi emphasized that despite what has happened, she will work for the inauguration of the square together with the patriotic activists. Fatah's Ramallah and El-Bireh District [Branch] Secretary Muwaffaq Sahwil explained that the postponement was done at the request of the leadership because it is busy, and that the inauguration will be held in the coming days. Sahwil explained to Al-Hadath that the postponement is connected to the presence of [public] figures [at the inauguration], and that because they are busy the inauguration has been postponed. Regarding the insistence of Rashida Mughrabi, Martyr Dalal Mughrabi's sister, that the inauguration take place on Monday at precisely 3:30 p.m., he emphasized that Fatah is the one that did this, and that she cannot act alone on the matter. It should be noted that in March 2016, Israeli Prime Minister Benjamin Netanyahu ordered his country's ambassador to the UN to submit a complaint against the PA due to the fact that it celebrates the anniversary of Mughrabi's death as a Martyr." The Yasser Arafat Foundation is, according to the foundation's website, "an independent and non-profit organization" that "receives governmental support and undertakes functions of governmental nature related to the preservation of the heritage of the [late PLO] President [Arafat]." The foundation emphasizes that "it enjoys legal, fiscal, and administrative independence," despite the fact that they receive "governmental allocations" of funding. Likewise, the "honorary president" of the foundation "is the president of the Executive Committee of the PLO/President of the Palestinian National Authority" - meaning the current foundation president is PA Chairman Mahmoud Abbas. The honorary president approves membership on the foundation's Board of Trustees. At the time of writing, PA Prime Minister Rami Hamdallah is on the Board of Directors, and several PA, Fatah, and PLO officials are on the Board of Trustees. 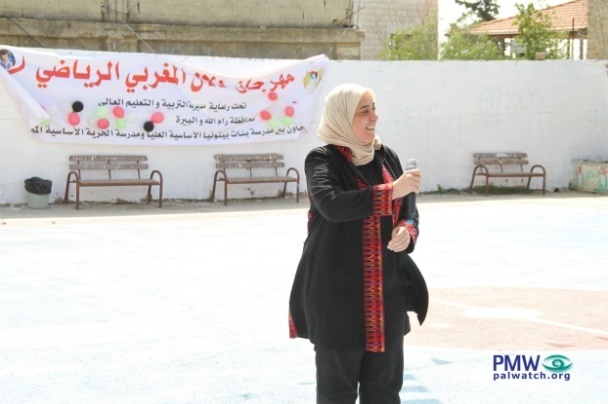 Posted text: "With considerable creativity, the events of the Dalal Mughrabi (i.e., terrorist who led murder of 37, 12 of them children) Sports Festival took place today [March 13, 2019] in the presence of Director of the Education Directorate (i.e., branch of the PA Ministry of Education) brother Bassem Erekat, District Governor of Ramallah and El-Bireh Laila Ghannam, and Beitunia Mayor brother Ribhi Dawla."